Don’t judge me, but I made this soup for a late breakfast on a particularly chilly morning, and it was perfection. 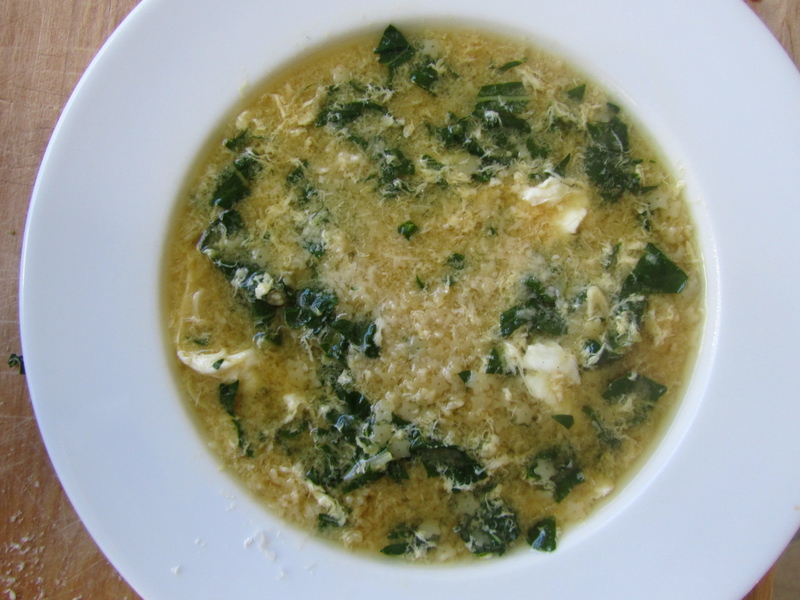 I’ve been really into Swiss Chard since I got it in my first CSA basket, and I’ve been putting it into everything I can think of (especially pizza, pasta, and soup), and as we all know I am obsessed with both eggs and soup, so this was really a winning combination for me. A quick vocabulary recap: Stracciatella means “little ribbons” in Italian. That’s what the “wisps” of eggs in this dish are (also seen in its cousin, Egg Drop Soup), and it’s also what the inside of burrata is called, expect those are mozzarella ribbons. Stelline is one of Barilla’s newest pasta shapes – little stars for soup! I love them! If you can’t find them, the O’s that look like Spaghetti O’s, Orzo, or any small Italian soup pasta would be a great substitute.